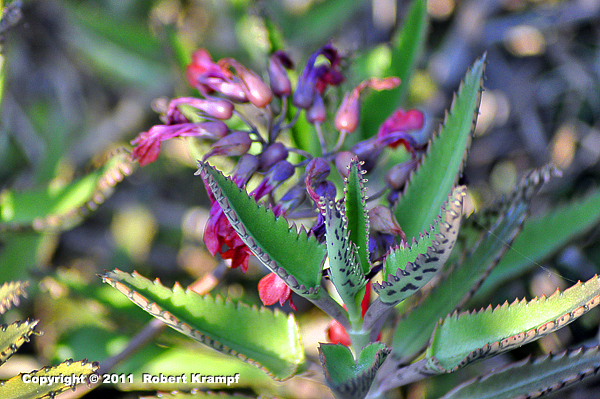 This is Kalanchoe daigremontiana, also known as Devil's Backbone or Mother of Thousands. Each of the tiny bumps on its leaves is a developing, new plant. When they are mature enough, they will separate from the parent plant, fall to the ground, and take root. This plant reproduces both asexually with its leaves, and sexually with its flowers. What is the advantage of sexual reproduction? No. Asexual reproduction using its leaves is actually faster than sexual reproduction, and allows the plant to produce more offspring. Sexual reproduction lets the plant produce more offspring. No. This plant produces more offspring by asexual reproduction than it does by seeds. Sexual reproduction prevents the plant from passing on harmful mutations. No. Both sexual and asexual reproduction can pass a mutation on to the offspring. Sexual reproduction gives the offspring genes from both parents. Yes! The main advantage of sexual reproduction is that the offspring gets half of its genetic material from each parent. This plant can reproduce asexually by producing the new, tiny plants on its leaves, but they are genetically the same as the parent. A disease or parasite which was fatal to one would be fatal to all. When it reproduces by flowers and seeds, half of the genetic material comes from the plant, and half comes from the pollen that fertilized seed. This produces offspring that have genetic variations, giving them a better chance of surviving. The survivors can then reproduce asexually to produce thousands of new plants with those traits. UT.7.IV.1.b Contrast the exchange of genetic information in sexual and asexual reproduction (e.g., number of parents, variation of genetic material).